It's Friday evening and a group of young women dance to pulsating beats at a local Zumba class. Besides providing a great workout, the class helps them let off steam and release some of the stress accrued from a week of college classes and studio work. These women are busy working toward a career that utilizes their communication, leadership, organization, design, and technology skills. They are the next generation of construction management professionals. No doubt about it, the construction industry has changed significantly over the past 20 years, and continues to do so at increasing speed. Technology is one of the main catalysts of this change. And because it is opening new doors for careers beyond physical labor, we're seeing an exciting influx of a younger, more diverse workforce. Are you considering a career in construction management? Learn about the resources available to you. "When I started my studies over 20 years ago, only 7 percent of construction management students were female. Now it is almost 30 percent. I’m seeing the same trend happening in the industry,” says Dr. Henriette Strotmann, professor of science and engineering at FH Münster University of Applied Sciences, Germany. 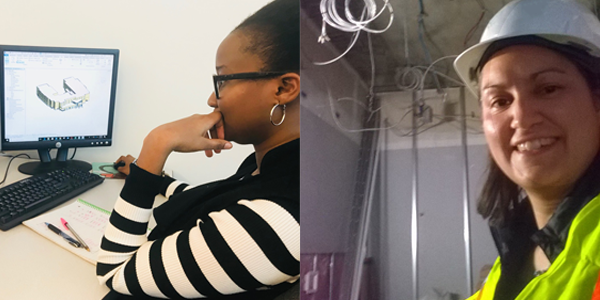 From the classroom to the job site, Fope Bademosi (left) and Evette Garcia LaRocco (right) exemplify the new generation of construction professionals. The construction industry is increasingly reliant on the ability of companies to modify their operations, protocols, and skill sets so they can succeed in the information and technology-driven future. The industry is transforming, with technological advances that touch all phases of a project. 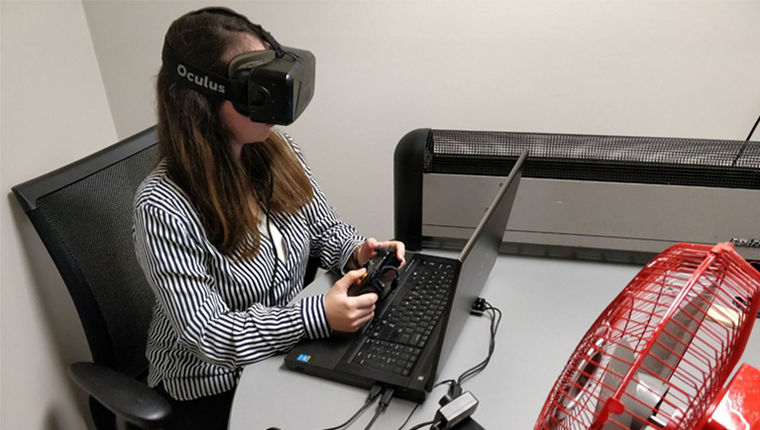 More construction projects are becoming digitized, using technologies like drones, augmented and virtual reality, laser scanning, 3D printing, robotics, and connecting Building Information Modeling (BIM) to the built environment. This has created many new and interesting job opportunities—and a growing demand for a workforce highly skilled in these new technologies. Job titles like Construction Data Scientist and Virtual Estimator are catching the eyes of technology-savvy people who may not have previously considered this industry. Gokce Ozcelik embraces the technology that is shifting construction industry practices. Augmented reality (AR) and virtual reality (VR) are making regular appearances in large construction management projects around the world. These tools are facilitating better collaboration and coordination between constructors, design personnel, and owners. Compared with traditional drawings, AR and VR can provide a more realistic vision for stakeholders. 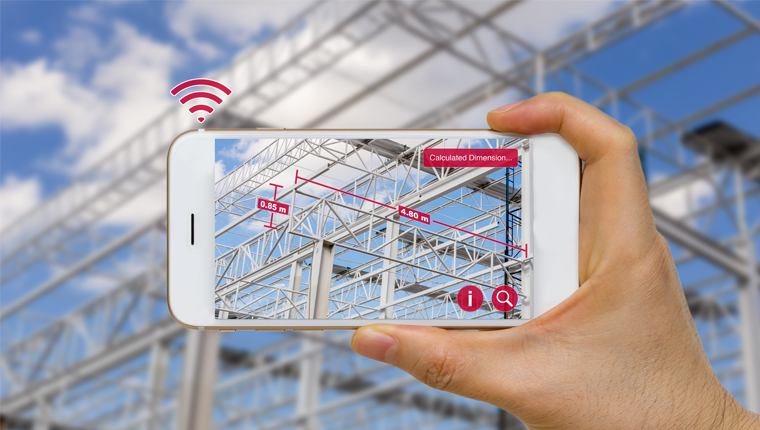 Augmented reality blends construction project planning with what you see on the job site. The new job opportunities being created in this industry are attractive, and the prospect of a rewarding and lucrative career is a compelling reason to consider it. The construction industry is still trying to recover from the downturn of 2008 when many workers left due to lack of viable jobs. Over the next ten years, the industry will lose hundreds of thousands of the remaining senior skilled workers worldwide to retirement. Businesses are extremely concerned about finding enough skilled candidates to replace the disappearing older workforce, as well as meeting the construction industry’s expansion demands. This opportunity for employment, exceptional salaries, and exciting new jobs is proving very enticing to the next generation—both male and female. “In the last few years I have noticed how intensively construction companies are trying to recruit students. It gives me confidence that after graduation I will not only be able to find a job right away, but I will be able to pick and choose the one that best fits my interests and skills and helps me develop my career further,” says Leonie Temme, a master’s candidate at FH Münster University of Applied Sciences in Germany. So, what advice do professors and industry professionals give to those considering a career in construction? 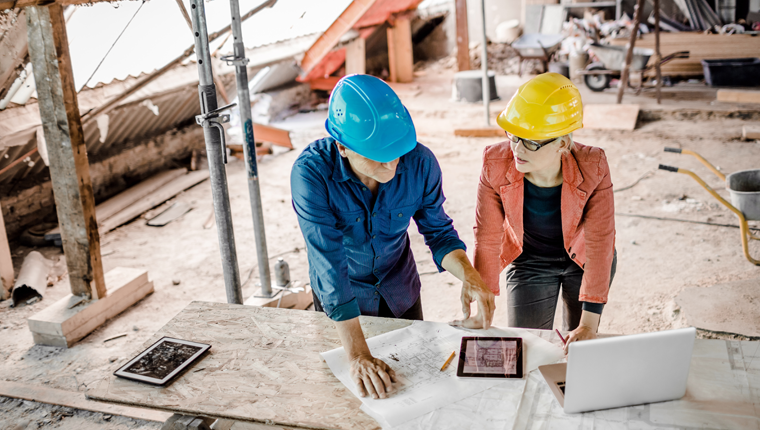 Successful construction industry professionals need to know how to negotiate and compromise in a collaborative environment. When the Zumba class comes to an end, the young women discuss their plans for the following week. They have a big project due and know it will be a stressful week for the entire class. They consider inviting their male classmates to join them for the next Zumba session. After all, everyone is welcome.